The daily Al-Akhbar newspaper reported that a new type of 9mm Machine gun, previously unseen in Lebanon, recently surfaced in the northern city of Tripoli apparently sported by Hariri supporters in the past few weeks. At a time when Forbes magazine rated Lebanon the 8th most dangerous place to visit on the planet (somewhere between Chad and Liberia) Machine guns have been the talk of the town for a number of months. Amongst rumours that everyone was rearming, which naively suppose that they did actually disarm in the first place, the price of light weapons skyrocketed. 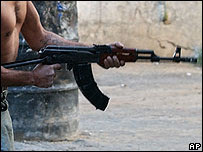 From discussing celebrity gossip, you could easily find yourself engaged in a casual conversation over the merits of AK-47s in street fighting, which despite a rise of 600% from an average of 100 US$ in the late 90s, was still good value for money compared to the American M-16.The latter being bulkier and harder to maintain. The word is that every Lebanese male is either armed or able to procure himself anything from a catapult to a Stinger missile within 45 min. An instructions manual will come handy and a weekend training camp will cover the practical aspect. The girlfriend usually joins in and gets to post her pictures in combat fatigues and firing position on Facebook. Every speech, celebration, anniversary is an excuse to test the goods with a random display of firepower on the street of major Lebanese cities, which occasionally lands an innocent bypasser in the Emergency room. The arms dealers are flooding back, local and foreign. Having gained additional experience in Bosnia, Sierra Leone and the Sudan they have returned with the latest models and unmissable deals: Two hundred for the price of one hundred and fifty… with the ammunition thrown in free of charge. Gosh, we enjoyed doing business here in the eighties. It was about time we came back. And you idiots are still buying! And unfortunately, the bellicose -and irresponsible- way the politicians have been talking as of late, those shiny machine guns will soon see some action. Everyday I am more convinced that we deserve those politicians.